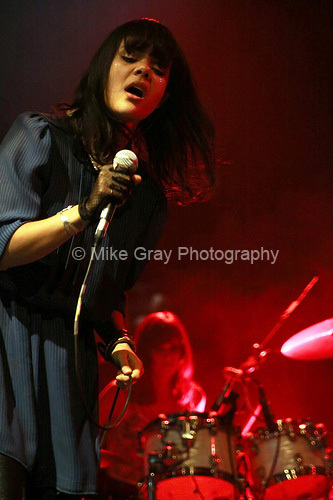 Shot Bat For Lashes last night, and felt they were 200% better than the shows I saw earlier in the year. Feels like the new band has really gelled. Did you just see the Manchester show at the Ritz last time round? That was their first of the tour (I think)and they struggled. I then saw them in Birmingham and they were a lot more together. These new shows though, I do agree, they're in a different league. I saw the Mcr one where I saw you, and Liverpool on the Sat. Rowdy crowds! Did you stay in the gig after the pit? Yes, I saw the Ritz show and had a really poor night - partly because of the band and the technical difficulties, and partly because of idiots who thought it was a good idea to spend the evening talking. But I did give them a second chance on that tour - in Leeds, I think - and found it little better, minus the technical issues. Thought this one was much better. I did stay when I got out of the pit for this one and thought it was much better. I'm still in favour of the 'classic' line up (IE the line up before the one that played the Radiohead shows) with percussion, not a drummer, though. the line up with Caroline Weeks et al? As in recorded the first album? Yeah, I kind of regret them going, extremely professional as this lot are. I saw the old line up at one of the warm up gigs before the Radiohead dates. I liked the way they changed instruments all the time, felt like a collaboration. That was at the Academy in Liverpool, did you go to that? I was a bit disappointed there as I went with friends and they just wanted to stand at the back, but made up for meeting Natasha outside. The Liverpool date before the Radiohead dates wasn't the 'old' line up I was referring to, that was more of an interim lineup which I can only assume was assembled solely for the purpose of playing the dates around that time. I think Liverpool was the first show with the live drummer - very few of the original band members were still about at the time.